Ovid's tongue-in-cheek guides to love! In his Handbook of Latin Literature H. J. Rose states, "Didactic Poetry had already been tried often enough, and sometimes it had been mildly humorous; Ovid hit on the brilliant plan of making it amatory, and thus achieved a masterpiece, never equaled in its own kind." Well-chosen selections and pithy summaries make this text an entertaining and effective learning tool for advanced students in either high school or college. Thompson has enhanced Ovid's Latin text with an excellent introduction, line-by-line notes, English summaries for the main sections and a basic vocabulary fold-out page. Ars Amatoria I 1-230, 243-282, 343-350, 417-434, 459-486, 505-506, 509-596, 603-668, 723-730, 733-738, 755-772. Ars Amatoria II 1-98, 107-156, 159-184, 197-236, 261-306, 309-358, 435-460, 465-466, 493-522, 529-544, 641-666, 733-746. Ars Amatoria III 1-12, 15-16, 31-36, 39-48, 57, 59-68, 73-80, 101-174, 185-200, 205-236, 243-310, 367-384, 433-436, 443-450, 499-520, 523-524, 577-588, 667-765, 809-812. 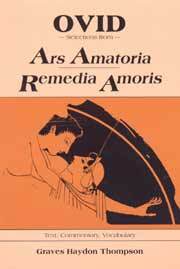 Remedia Amoris 1-30, 39-58, 65-98, 107-110, 115-154, 169-248, 291-336, 339-356, 441-450, 489-504, 523-542, 579-608, 643-682, 685-698, 707-724, 811-814.